An original puppet used on a children's TV show in the 1950s has sold for a record price at auction. The Sooty glove puppet had been expected to sell for anything up to £3,000 and auctioneers said there had been "interest from around the world". However, the toy was bought on Monday by a bidder in the room for £14,500. The anonymous buyer said the puppet would now go to the north of England, into their "large collection of TV puppets and memorabilia". 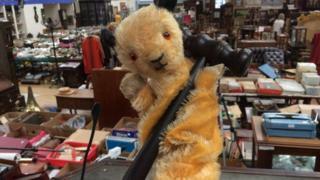 Derbyshire's Hansons Auctioneers also held the previous record for selling a similar Sooty puppet to presenter of the Sooty Show, Richard Cadell, for £3,100 in 2008. Sooty was invented in 1948 by Harry Corbett when he bought the toy in Blackpool for 7s 6d (about £11.50 in today's money) to entertain his children on holiday. Their act was turned into a TV show in 1952 after the pair entered and won the BBC's Talent Night programme. Five years later, Mr Corbett gave the original puppet to his friend and Blackpool-based musician Arthur Abbot, also known as Art Johnson. In a letter sent with it, he wrote: "I have great pleasure in sending you one of the Sootys which I have used on television. "Actually, he was in a programme where he got rather messed up, and he has since been washed." The Sooty puppet more recently belonged to Mr Abbot's son, Dr Steven Abbott, from Tewkesbury, Gloucestershire. He said: "I loved watching The Sooty Show with my sister, Lorraine, when I was a child. "He was given to my father two years before I was born and when my sister was 16 months old. We knew he was a genuine Sooty from the TV show but were allowed to play with him."